Made my first official vlog. Since this is my first attempt, I hope these things can be overlooked. Be sure to check out all the other amazing vlogs and blogs on the You Can Do This Project page. Ah Jess, so good to "see" you. Your VLOG was wonderful and conveyed such a powerful message. Thank you for the message to us D' rents. I appreciate it. Many of your posts and this are slowly preparing me for when I am no longer the one in "control". My eyes are now open to the fact that Joe will struggle at times in taking good care of "D". I appreciate this. Nicely done, Jess. Thanks so much for sharing this message with the rest of us. Lots of Love to you, my friend! 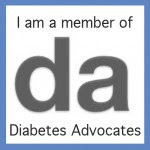 Key phrases that I love - "no diabetes guilt" and "progress, not perfection." Really well done, Jess! I think that talking to the kids, parents, and adults somewhat separately was brilliant! What an honest portrayal. Great going, Jess. You are a natural for this medium. This is a bit of an ode for parents everywhere. Very inspiring. Jess! What a FABULOUS video and message! Thank you! Oh yeah! I HATE when my hair gets in my eyes like that. LOL! Really well done, Jess. And you have a great voice! LOVE this, Jess. YOu covered soooooo many areas! So genuine and real. Hi, Jess. Thanks for reminding me that the diabetes army has our backs!